Henrik Sedin is a Swedish professional ice hockey player with a net worth of $40 million. Currently, he is the captain of the Vancouver Canucks in the National Hockey League (NHL) and plays the center position. 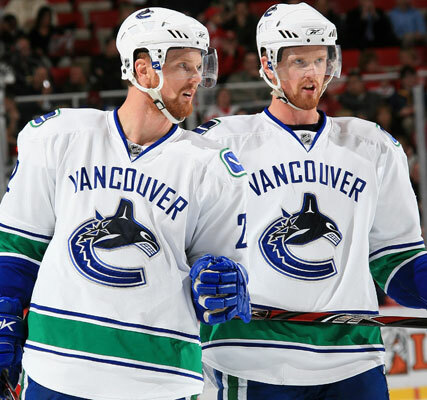 He is the twin brother of Daniel Sedin who also plays for the Canucks. The two began organized hockey at the age of eight. In their current team, Henrik is a skilled passer and known as the playmaker while Daniel is known as the goal scorer. Henrik has led the league in assists for the past three seasons and he became the all-time leading scorer for the team on February 15, 2013. Sedin began his career in the Swedish Elite League with Modo Hockey in 1997. He was co-recipient, with Daniel, of the 1999 Golden Puck as the Swedish player of the year. He was the third overall pick, one pick after his twin, in the 1999 NHL Entry Draft and he has spent his entire career with the Canucks. After four seasons, he became the club’s top-scoring center in 2005-06. Since then, he has won three Cyrus H. McLean Trophies as the team’s leading point-scorer from 2007-08 to 2009-10 and one Cyclone Taylor Award as the team’s most valuable player in 2010. He won the Hart Memorial and Art Ross Trophies in 2009-10 as NHL’s most valuable player and leading point-scorer, respectively. In the same year and in 2010-11, he was also named to the NHL First All-Star Team. He was included in the Stanley Cup Finals in 2010-11 where Vancouver lost to the Boston Bruins in seven games. He and Daniel were named co-recipients of the Victoria Stipendium as Swedish athlete of the year in the summer of that season. Henrik Sedin also plays for the Swedish national team and is a two-time Olympian who also helped Sweden to a gold medal at the 2006 Winter Games in Turin. He had four appearances at the IIHF World Championships where he won bronze medals in 1999 and 2001. At the junior level, he had one appearance in the World U17 Hockey Challenge where he won silver, two European Junior, and three World Junior Championships. The below financial data is gathered and compiled by TheRichest analysts team to give you a better understanding of Henrik Sedin Net Worth by breaking down the most relevant financial events such as yearly salaries, contracts, earn outs, endorsements, stock ownership and much more.